Grab a sneak peak of the new season of Playtime with this gallery of images taken from the 2nd episode of season 4. These images are taken directly from Episode 2. If you’re worried about spoilers, you might want to steer clear! Want to see more of Playtime Season 4? Just click here for all news and posts. 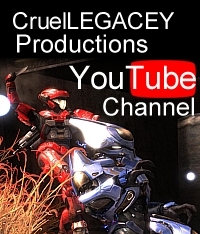 This entry was posted in halo reach, Playtime, Playtime News, Video and tagged machinima, playtime, season 4. Bookmark the permalink. Thanks for the glimpse, really looking forward to the next season!